Part 3 in our look at the 2012 RTI 3D-ASIP. The Wioming program was first described by ST Ericsson at last years 3D ASIP conference [see IFTLE 86, "3D Headlines at the RTI 3D ASIP part deux"]. This year partner Denis Dutoit of CEA Leti shared more information. 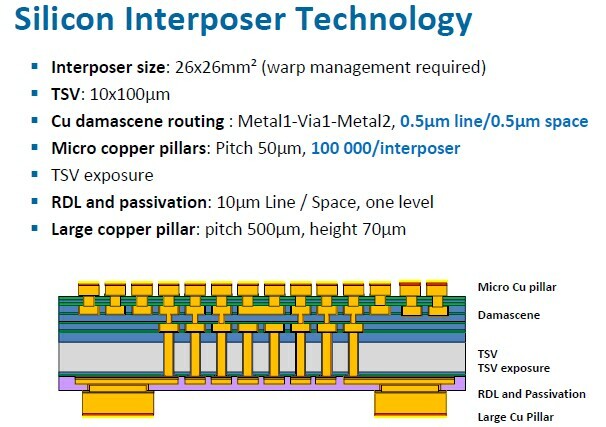 WIOMING (Wide IO Memory Interface Next Generation) program was launched by ST-Ericsson with the goal to enable increased graphics performance at reduced power levels for its smartphone applications. Front side micro pillars are 10 micron in height, 25 micron in diameter with a 50 micron pitch. They are composed of a Cu/Ni/Au stack for oxidation protection. There are 100K per interposer. 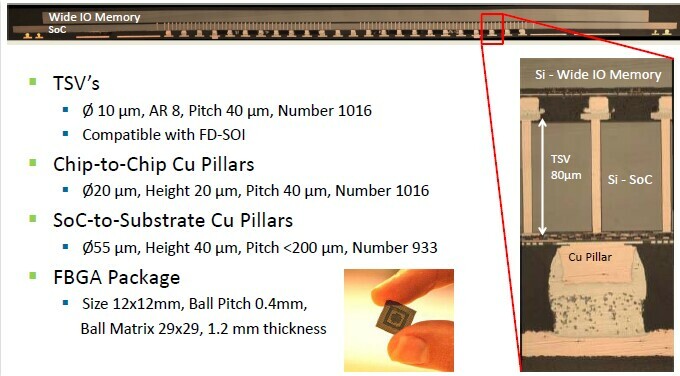 Backside RDL consists of 10 micron L/S with organic passivation and 250 micron dia on 500 micron pitch Cu/Ni/Au pillars (total thickness 70 micron). 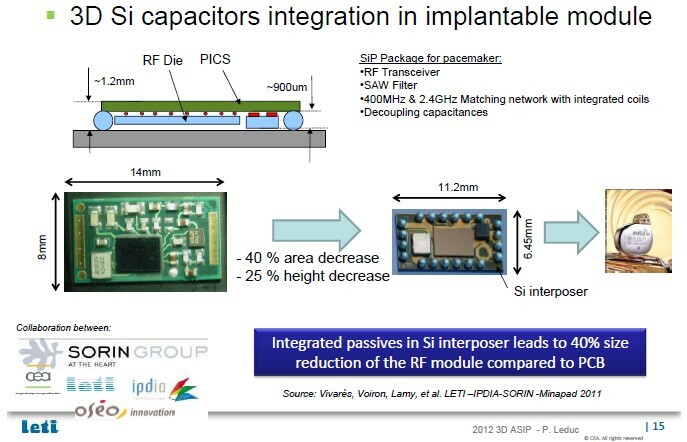 They see interposers evolving into "smart interposers" which can be used as RF platforms such as the pacemaker component shown below. Leti is convinced that decreasing the TSV diameter can decrease cost by taking up less surface area of the device. 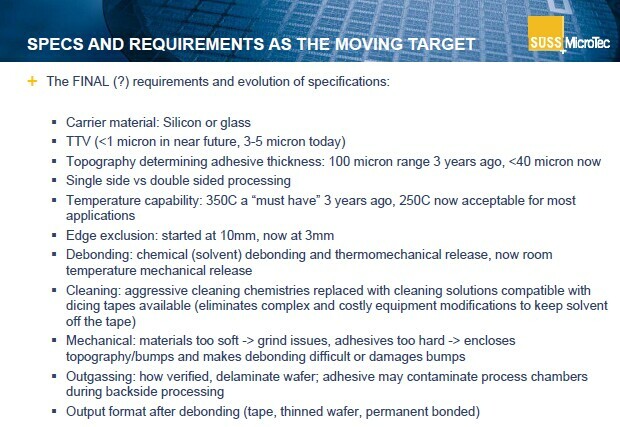 They are now capable of 3 micron diameters TSV in 15 micron thick Si. Wilfried Bair of Suss MicroTec looked at the technical issues holding back the bond/debond process and concluded the following are the current specs for the process. After my recent Lester the Lightbulb rant [link] SST gave equal time to the green enery lobby by printing a blurb from the “consumers union” indicating that their LED bulb “ hanging over the sink in our lightbulb lab” had been on for “19,000 hrs non stop” and then as if to brag added “â? ?¦unlike other tested bulbs which are cycled on and off”[ link]. To the uneducated consumer this may sound great, but it is just another bogus statement by the green power front. The point they miss (intentionally? or just ignorantly?) is that power cycling is required to see failure. It is well known that bulbs fail during such power surges not while the bulbs are lit. We have discussed this in depth in our previous Lester articles . Also, as if our friends in the CFL lobby aren’t having enough issues with mercury contamination[link], we now find out that there are also issues with UV generation which could turn your barc-a-lounger into a tanning bed (OKâ? ?¦ a bit of an exaggeration). All fluorescent light bulbs emit UV rays when hit with an electric current. In their normal construction the UV is absorbed by a layer of phosphors, on the inside of the bulb . If that phosphor coating cracks, UV light escapes. According to the researchers at Stony Brook [link], defects are common in nearly all the bulbs they collected from retail stores. "When the bulbs are twisted into their signature spiral shape. That’s when you get into trouble, because [phosphor] is brittle, and it can’t take the curve," says materials science Professor Miriam Refailovich, who led the research. This has led reports by the NIH (national institute of health) to warn "â? ?¦ don’t use them in lamps that are close to your body" [link] (like end tables next to your favorite reading chair ? or your childs bedside lamp where they read at night?). Inside most white LED bulbs is a blue light source, which is converted to a full spectrum of colors by phosphors. Unlike CFLs, even if the phosphor coating is damaged, the blue light is in the visible spectrum, and poses no danger to human skin. However there are reports that such blue light waves may be “â? ?¦especially toxic to those who are prone to macular problems due to genetics, nutrition, environment, health habits, and aging” [link]. German scientists have warned that the large proportion of blue light emitted by CFLs can lead to a diminished production of the hormone melatonin which can lead to a wide variety of diseases and conditions: sleeping disorders, cancer, cardiovascular disease, etc. [link].The environmentalists at Univ of California are also focusing in on LEDs after finding that they contain "..lead, arsenic and a dozen other potentially hazardous substances." Evidently the “reds” contain "..more than 8x the lead allowed under California law." Ogunseitan added that "Although widely hailed as safer than compact fluorescent bulbs, which contain dangerous mercury, they [LEDs] weren’t properly tested for potential environmental health impacts before being marketed as the preferred alternative to inefficient incandescent bulbs, now being phased out under California law." California Assembly Bill 1879, which would have required advance testing of replacement products, was originally scheduled to go into effect on Jan. 1 but was opposed by industry groups, according to the university [link].